This tool is used as an extra hand when woodworking or metalworking where gluing, welding or bolting is required. Consisting of 2 horizontal bars joined together by a vertical bar. There is a large screw on the lower bar with a plastic cap connected to a ball end allowing the end to sit at different angles whilst not marking the object which is being clamped. Can also be used as a simple mechanical device used for lifting engine or transmission parts. The clamp has an adjusting screw to tighten onto the part and a lifting bar to attach to a hoist cable. 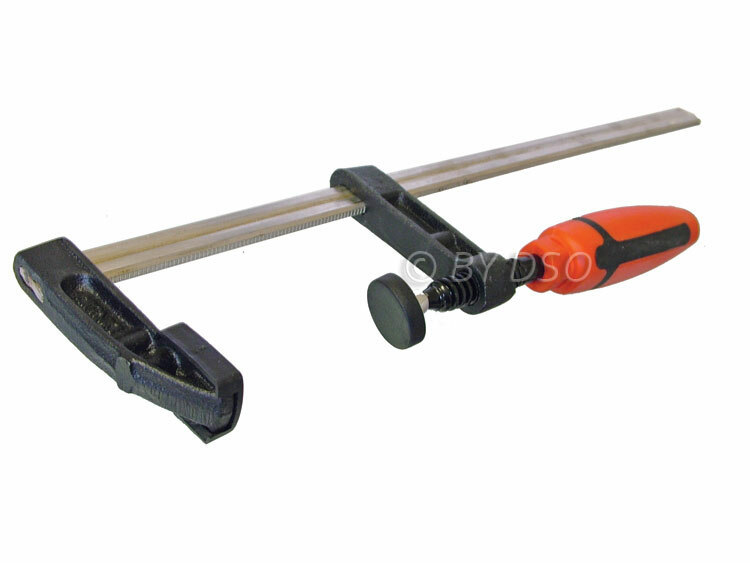 This clamp extends to 300 mm and has a clearance of 50 mm. Made of Steel DIN5117 with comfortable a rubber handle and non-marking plastic tips for the two vertical bars. There is a clearance of 50 mm from the bottom of the vertical bar to the centre of the plastic clamp ends.